“We remained in the line until Friday, July 28th, and during our four days’ turn of duty I visited all the companies up in the front line. On one occasion I had a hot time being caught in a nasty shrapnel barrage at one point, and then landing amongst some heavy stuff at another. It was “windy” work, but I got safely back to White City. Parts of the front line trench were non-existent as a result of the enemy trench-mortar bombardment, and one had to crawl across these gaps to escape observation from the German snipers. It was exciting. 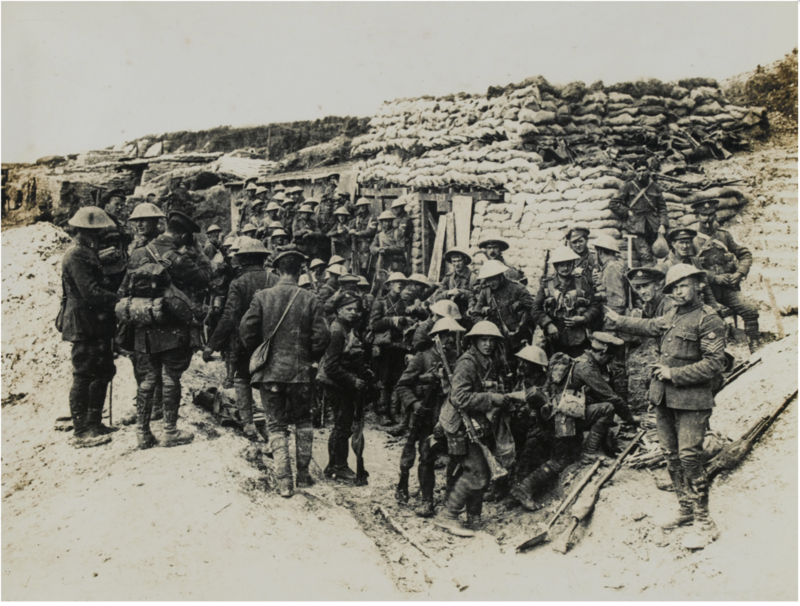 “We packed up about noon on the 24th – and moved into the trenches in front of Auchonvillers. It was a long trail – about 7 miles – and I was at the rear of the column, as usual. Just as we were approaching Battalion Headquarters at White City and going down the communication trench, named Fifth Avenue, the Huns spotted us, and started shelling with whizz-bangs. We got merry Hell for 20 minutes, and I thought my last minute had come. We lay like pancakes at the foot of the trench till it was all over. Four men were killed and three wounded. They belonged to the 9th Fusiliers whom we were relieving. The trenches were blown in. I attended to them and sent the wounded men back in charge of stretcher-bearers. Then I went on to my Aid Post which was fully 400 yards from Headquarters at *White City, at the junction of Mount Joy Avenue and Roman Road. It was a hopeless place, and I found that I couldn’t get a stretcher into the dug-out. Then the Huns started to drop shells all round the place – great big “crumps”. They smashed up our engineers’ dump close by – picks, shovels, wheel-barrows etc, were flying all over the place, and the trench was knocked in. 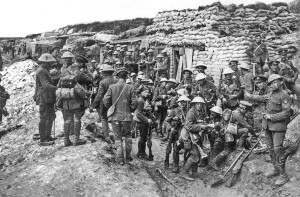 With my stretcher-bearers I took refuge in a 20ft deep dug-out near at hand. Whilst disappearing into this refuge I was violently struck by a piece of something hard – wheel-barrow, shovel, shell, I know not – on the back. This helped to accelerate my descent into the lower regions, and luckily only badly bruised me and gave me a fright. 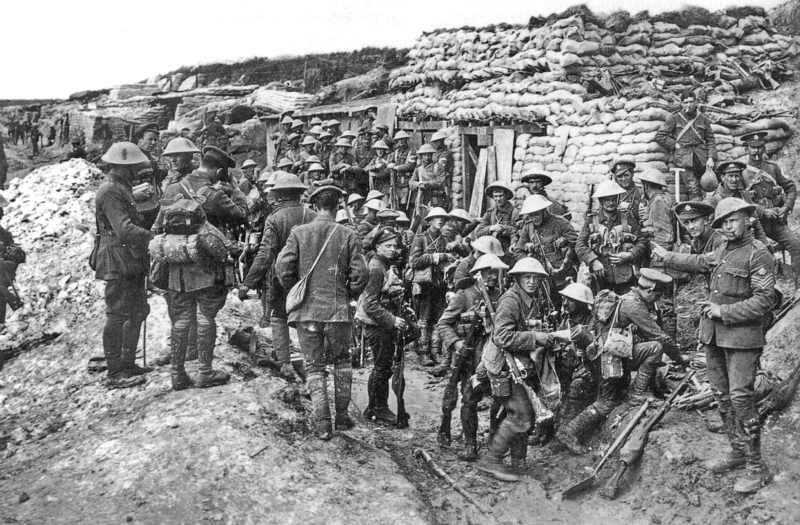 *White City was a dressing station that was so called because it was dug into a chalk ridge, near Beaumont Hamel. *Douglas had attended George Watson’s College in Edinburgh with James Dandie. 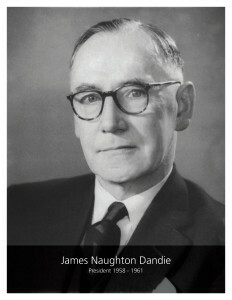 James Naughton Dandie saw the whole of the war on the front, having served since 1914 with the Royal Garrison Artillery. Born in 1894, he was the same age as Douglas and had a distinguished career both in the war where he became Acting Captain and like Douglas won the Military Cross. By the time of the second world war he was practising as a solicitor in the Stirling area, later becoming President of the Law Society of Scotland and lived until 1976. “We left Morlancourt on July 13th. Before we left the Bantam Division came into the village. I saw some of the Edinburgh “Bantams” but hadn’t time to look for Gordon Sturrock. We marched via Ville, Buire, Lavieville and Henencourt to Warloy. We had a triumphal procession. Some of our men carried captured German helmets, caps & c and in the villages we passed through the battalions turned out and gave us a great reception. A great body of cavalry passed us going towards the front. We cheered them on, and they gave us a cheer. When we got to Warloy about 10.30pm we found that the Brigade had gone on in motor buses to an unknown destination! We were left behind, forgotten and uncared for! However, we got hold of the Town Mayor, who found us billets, and food. I had a heavy doze of cold, and felt pretty miserable. 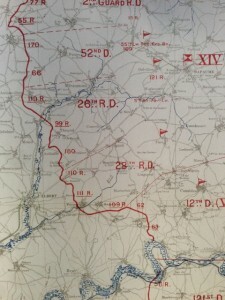 Heard that the 3rd, 7th and 21st Divisions attack the German 2nd line at dawn tomorrow. We rested all next day (July 14th) in Warloy and I spent most of the day in bed trying to get rid of my cold. 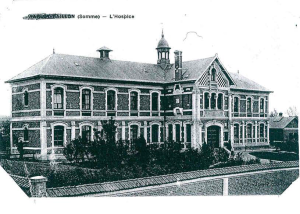 On 15th July we got word from Headquarters to proceed to Thievres and I was conveyed there in an old field ambulance feeling pretty miserable with a sore throat and bunged up head. No sooner had I rejoined the 130th Field Ambulance than I was pushed off to Authie to do duty as Medical Officer with the 13th Royal Welsh Fusiliers. Their Doctor, Capt. Lawrence – was killed in Mametz Wood. The Commanding Officer – Col. Campbell – was a Scot, and a right good sort. I got a good billet. 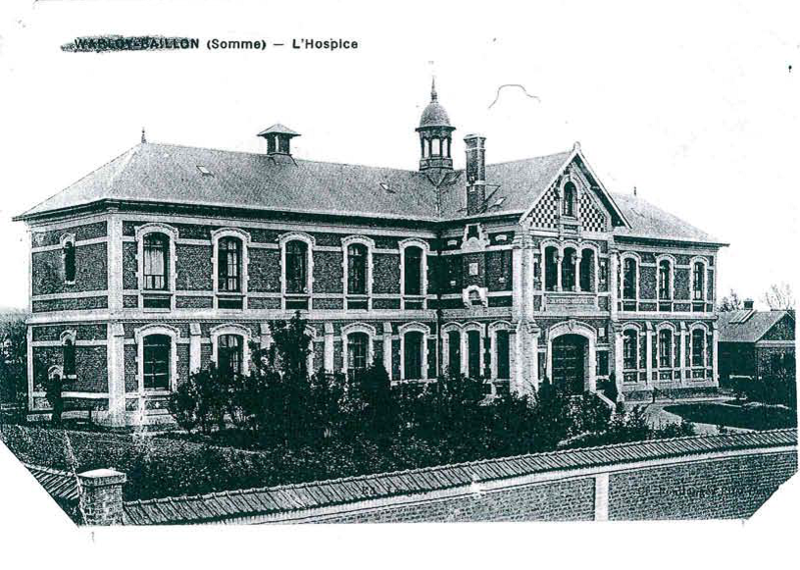 The Battalion only remained in Authie village for two days. On one day we were inspected by Major General Hunter-Weston the Corps Commander, and on the other I got 200 men of the Battalion bathed at the baths at Covin. I had a grand, hot bath myself! After the 13th July Douglas describes the men on the move, sick, injured and practically exhausted after the trauma of Mametz Wood. In fact they had suffered so much that the whole 38th Welsh division was withdrawn from frontline combat for a year and didn’t fight again until 1917. 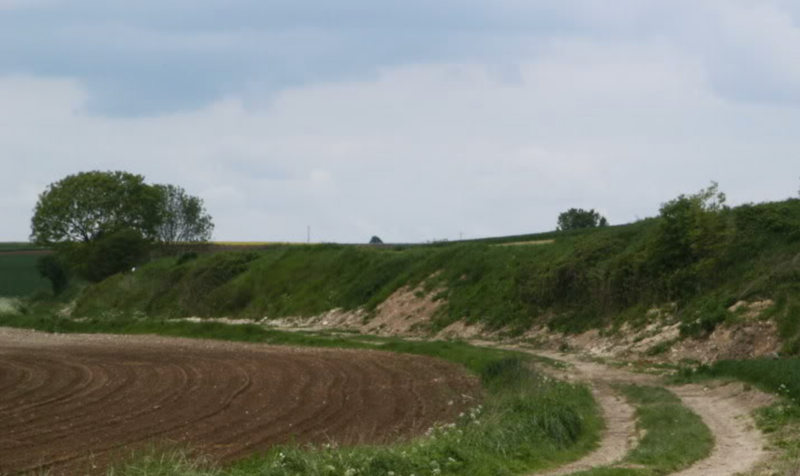 They made their way slowly back behind the lines to Poperinghe, west of Ypres which was considered to be safe in British hands, at least for the time being. “All that night and all next day (11th July) and night right up till 9 0’clock on Wednesday, July 12th we were busy getting all our wounded and evacuating them. 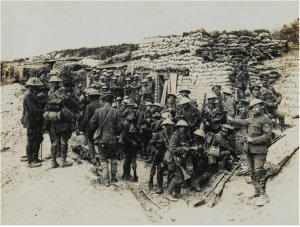 On both nights 100 cavalry men came up to clear the wounded from Caterpillar Trench, but they weren’t of much use to us as they were all, officers included, all terribly ‘windy’ and scattered whenever a shell dropped anywhere near them. They had never been under fire before. I saw the 14th Welsh come out of the wood – 180 strong – and only two officers to lead them. The 13th Welsh came back about 200 strong. It was a terrible sight. The cold was intense, both nights we got no sleep. I felt pretty rotten by 9 o’clock on 12th July when we were relieved as I’d had no sleep for three days and nights and had been on my feet practically all that time, attending to wounded. Food hadn’t been plentiful either, except tea and biscuits, but a bottle of brandy and a slab of chocolate spun out over three days, helped to keep spirits up. On our relief we trudged wearily up to Minden Post. Then the Huns shelled us heavily and wounded a few men slightly. We were all so tired that we could hardly throw ourselves into shell-holes to get cover. In fact, I think we were so dazed that we didn’t bother what happened to us. We stood on the crest of the hill for a moment to watch the Huns shelling Contalmaison. We were promised motor lorries to convey us back to Morlancourt, but none appeared and we had to send them down in relays of motor ambulances. The result was that I didn’t get down till 3 o’clock in the afternoon, but I got some good hot food and felt better. 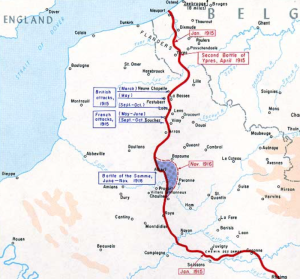 Colonel Davies and some officers left for Mericourt to entrain for Veuchelles near Langpre between Amiens and Abbeville. Our wearied stretcher-bearers with myself and other officers were left behind to rest and were very kindly treated by the 23rd Field Ambulance, officers and men. I had a shave and a good wash and bedded down in a tent at 6pm – dead beat! 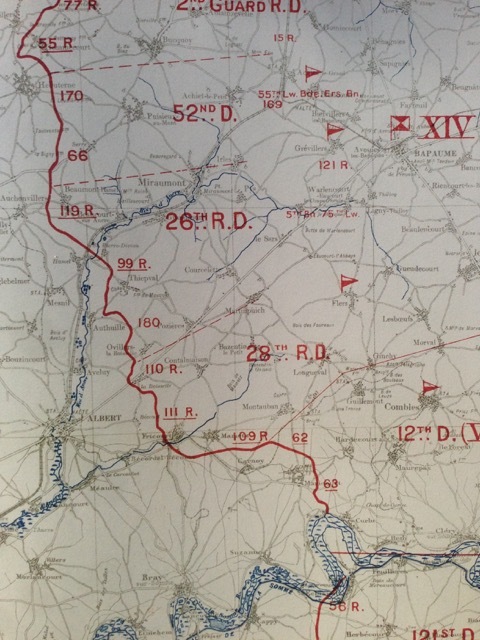 The 38th Division, although practically wiped out, did its job and captured Mametz Wood. The 113th *Brigade mustered up a little more than a thousand men after the battle. *A Brigade would normally consist of 3000 to 4000 men, made up of usually four battalions. Two brigades would make up a division. “On Sunday July 9th, I marched on to the Minden Post. 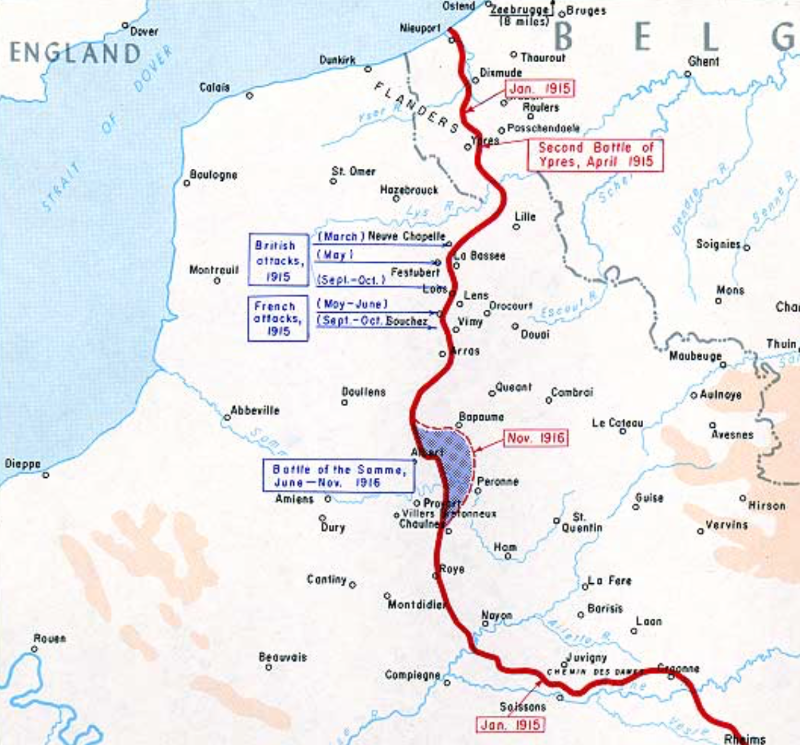 The 114th Brigade attacked Mametz Wood at dawn on 10th and we got orders to evacuate the wounded from the field of battle. Our artillery played Hell with the Hun alright and we did not sleep. We were on the move at 2am on 10th July and marched through mud and dirt to a spot in the old German line called ‘The Triangle’, passing through the remains of the village of Carnoy. Our Dressing Station consisted of one filthy dug-out with a foot of water in it. Capt. Anderson and I with a few men remained here whilst Lieuts. 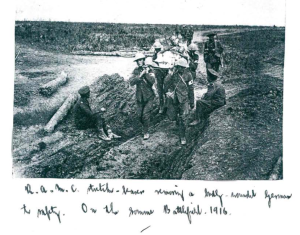 Anderson and Buckly with the main body of the stretcher-bearers went further forward. Between three-thirty and four a.m., our guns bombarded the German position. The din in the valley – Happy Valley – it was named – was terrific and the flashes of the guns lit up the whole countryside. The noise of the shells swishing over our heads towards German territory seemed to be like a load pressing down on one’s head. Our attack on Mametz Wood was due to start at 4am. We got the first casualties in by 5 o’clock and had them coming down from the front line by the hundreds all day. Capt. Anderson and I worked like niggers all day and had no time to take food until 3p.m., when we had a tin of tea and some bread and cheese, at the Divisional Rest Station behind us. 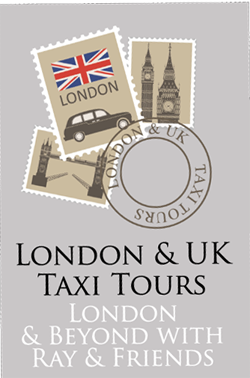 It was most welcome and did us good. Some of our poor men were horribly wounded. The 14th Welsh got badly cut up, nearly all the officers being wounded. My friend Major Williams, was brought down to us on a stretcher, badly wounded in the abdomen. He must have been suffering agonies of pain, but was very cheery. He lived alright, but it was a miracle. Douglas throughout the mayhem managed to get some time away from the chaos to survey the scene for himself and gives us a fascinating eye-witness account of part of the battle. It is important to note that his use of phrases like “It was a wonderful, never to be forgotten sight” is meant to convey the enormity of what was taking place rather than any glorification of scenes that he witnessed. *The village of Mametz in the Somme Valley is not to be confused with Mametz in the Pas de Calais where Douglas met Gwilym Lloyd George on 20th December 1915. Read about that meeting here. R.A.M.C. stretcher–bearers removing a badly wounded German to safety on the Somme Battlefield 1916.